The Headquarters of popular Lagos church Lord’s Chosen and Charismatic Revival Church, founded by Pastor Lazarus Muoka, has been sealed off by the Lagos State Government for allegedly defacing and constituting environmental nuisance to its environment. 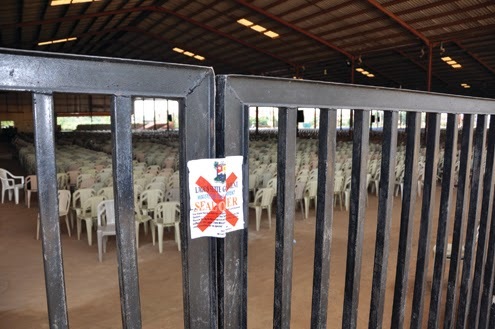 The church, located in Ijesha on Oshodi-Apapa Expressway in Lagos, was shut down on Sunday Oct. 6th by officials of the Ministry of the Environment and prevented thousands of worshipers from having their Sunday service that morning. The commissioner also said the church had a habit of burning its refuse inside the church, an action that is against the environmental and sanitation law of the state. He said the church will be re-opened only after it builds new toilets, build a sewage septic tank for the treatment of waste water, remove all illegal attachments built on drainage channels, keep the environment clean and ensure that none of its members trade on the expressway. NO ACT OF TOLERANCE IN LAGOS!! !